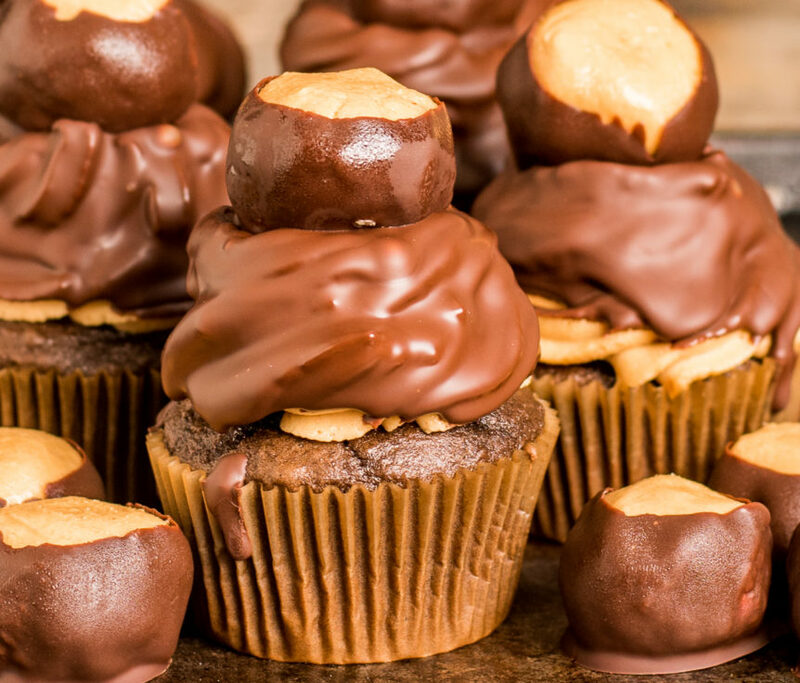 Rich and decadent Chocolate Dipped Buckeye Cupcakes from Ohio food blogger Tastes of Lizzy T are perfect for game day or any time! In a large bowl, beat together the cake mix, eggs, butter and milk. Mix for 2 minutes on medium speed, scraping the sides of the bowl as needed. Place paper cupcake liners in a muffin pan. Use an ice cream scoop to scoop batter into cupcake liners, filling ⅔ of the way full. There should be enough to make 24 cupcakes. Bake for 19 minutes or until the top of the cupcakes spring back when you touch them. Allow the cupcakes to cool on a wire rack. In a large bowl, beat the butter for 1-2 minutes until it is almost white in appearance. Beat in the peanut butter and vanilla extract. Add two cups of powdered sugar and beat well. Add in the remaining powdered sugar and beat again. Add heavy cream, one tablespoon at a time, to achieve the buttercream consistency that you’d like for spreading or piping the frosting. If you are piping the frosting, be sure the frosting is not too soft so that it holds shape. Use Wilton Tip 1M to pipe swirls of frosting on top of the cupcakes. Place the cupcakes in the refrigerator for at least 1 hour so that the frosting can set before dipping in chocolate. Place the chocolate in a microwave-safe cup or dish. Melt in 20-30 second increments, stirring each time. Once the chocolate starts melting, reduce the time to 10-15 seconds. It’s important to melt the chocolate slowly and stir it often so that it does not burn. Take a cupcake, turn it upside down and dip it quickly down into the melted chocolate. Pull it back up and allow the chocolate to drip off. Once the excess chocolate has dripped off, turn the cupcake over. Gently push a buckeye into the top of the cupcake while the chocolate is still wet, if desired. Once the chocolate has completely set, store in an airtight container at room temperature. Feel free to use the ingredients on the back of the cake mix box to make the cupcakes. 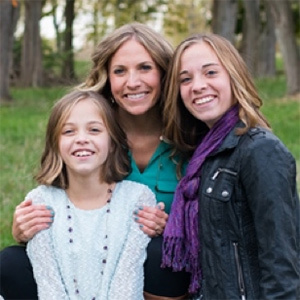 Julie Clark blogs with her daughters, Maddie and Kinslee, at Tastes of Lizzy T. Starting as a mother and daughter school project, their blog shares the life journey of a family that loves to cook, serve and eat fresh, traditional and wholesome food. Their mission is to revive the thrill of preparing and sharing comforting, heartfelt food with family and friends.